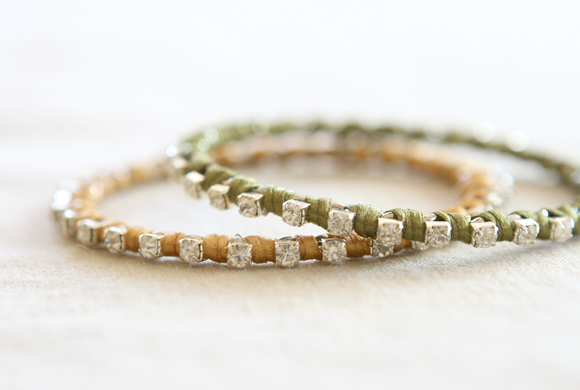 Just about every store I stop into lately, from Ann Taylor Loft to Forever 21, has some version of these ribbon and rhinestone bracelets. They look simple enough to make, so I thought I'd try a little DIY action. 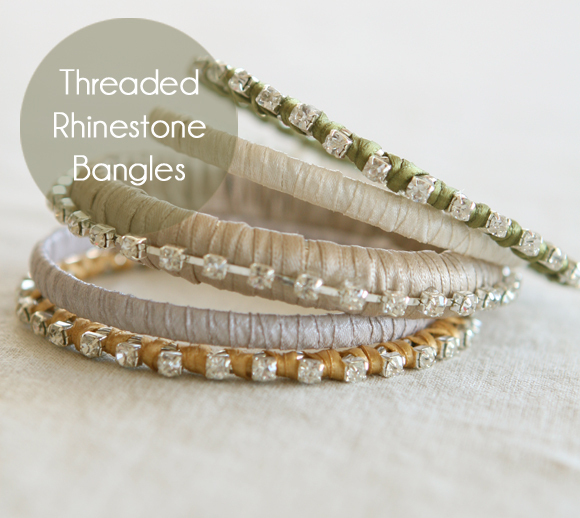 While I'm not a huge rhinestone nut, I do like the somewhat subtle look of these and love that you can wear them stacked for a night out, or wear a single bangle for just a bit of added sparkle. I personally think my camo jacket was screaming for a little glam and glitz today, so I added a pair of these for the first concert in the park of the season. I bought both 1/8" and 1/16" ribbon just to see which one would work best, and it turns out I used them both. The rhinestone size is 4mm and was all that was available at Joann's, using my 40% off coupon of course. As far as bangles go, you can use just about any shape and size, as you can see above. You will also of course need some scissors and a hot glue gun. 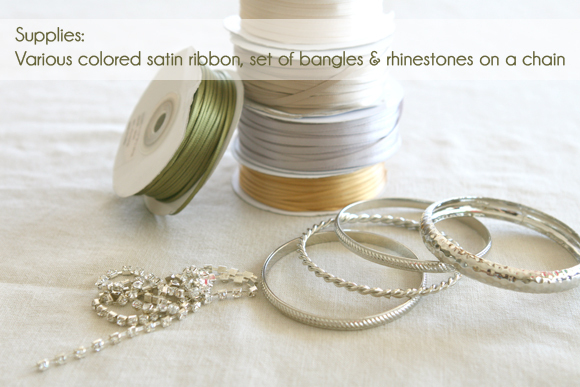 To make a solid satin ribbon wrapped bangle, start by adding a small drop of hot glue to the underside of the bangle to hold the ribbon in place, and then start wrapping the bangle. I used the 1/8" ribbon for this style. 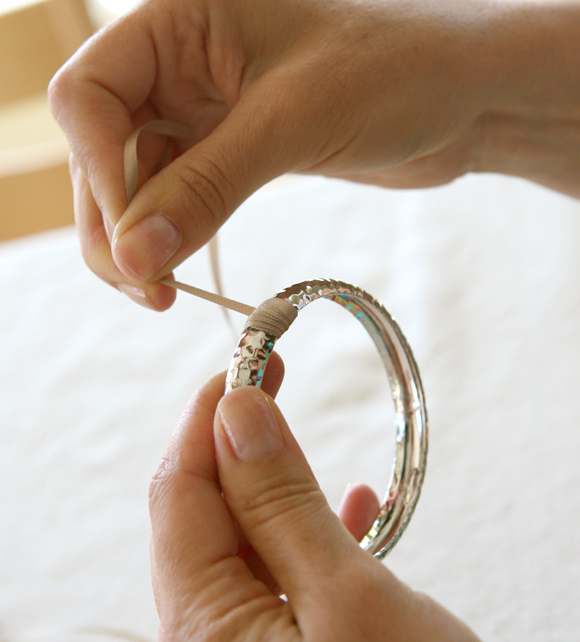 Once completely wrapped in ribbon, glue the end of the ribbon down, and add another small dot of glue to the top of the satin covered bangle, and affix the rhinestone. Add small drops of glue all the way around and repeat the process, being very careful not to add too much glue so that it spills over the backside of the rhinestone. If you do get a glob of glue on the side of the rhinestone or on the ribbon, simply heat up with the tip of the glue gun and pick off the melted glue. 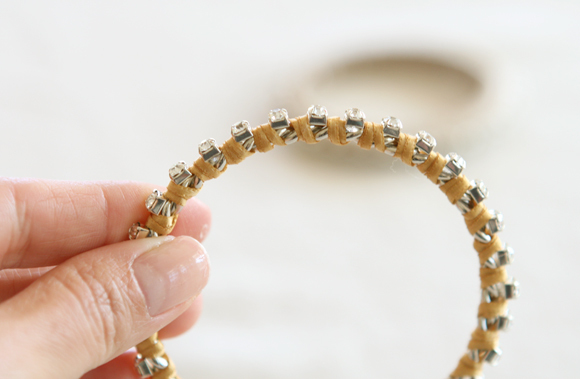 To achieve the threaded look, start in reverse by affixing the rhinestone directly to the bangle with dots of hot glue. 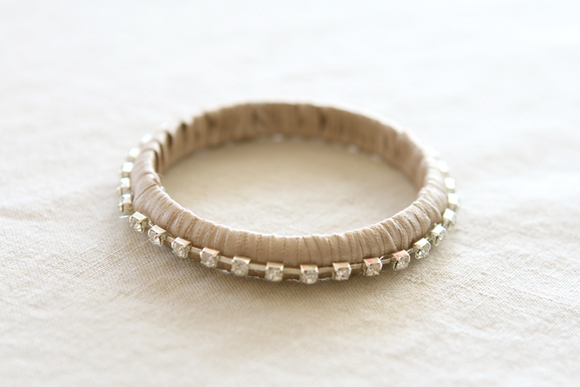 Then add the ribbon in between the rhinestones by first gluing the ribbon to the underside of the bangle, and then wrapping the ribbon 2-3 times between each rhinestone, continuing all the way around. I used the 1/16" ribbon for this look. 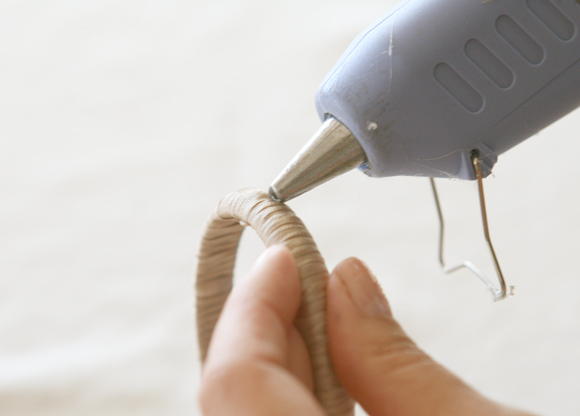 Add a drop of glue to the end of the ribbon and cut off the excess. You could do all one colors, but I really like the way the different colors blend together, plus I have more color options for various outfits. 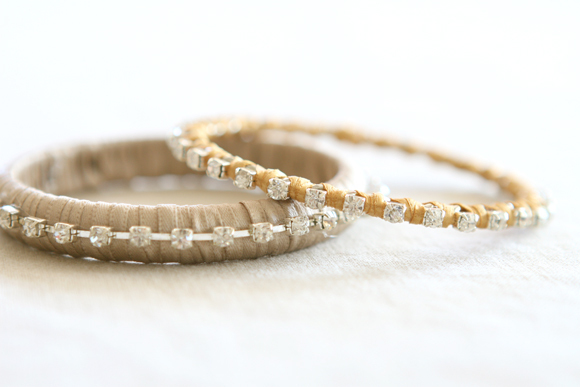 I also made a couple of just plain satin wrapped bracelets without the rhinestones to break the sparkle up a little. Easy peasy right? Let me forewarn you that the rhinestones on these do snag a bit so don't wear your most beloved silk top or delicate sweater, or risk some runs and pulls. 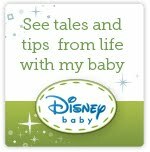 I hope you enjoyed this little tutorial, and please let me know if you try it! I'm also linking up to Get Your Craft On at Today's Creative Blog for the first time! Those are soooo beautiful! I actually think I could do that. I love the colors you chose. OOOOH, fancy pants. LOVE these!!! The photos in these are great Andrea. Such nice lighting. And the bracelets look great too! you're so fancy! great idea! omg so cute!!! Love them! Love the bracelets and the presentation of them. 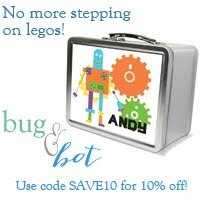 Really pretty, and so easy too! What a great combination. I'll definitely put this in my 'to do' file. these are SO SO pretty! great idea! where did you get your rhinestones from? Mandy, Sure I'll sell them to you for 1 million dollars! :) Rebecca, I picked mine up from good old Joann's but I'm sure a real fabric store would have many different size options. impressive, you DIYer. just tell those retail stores, "don't insult me with your wares when i can make my own for less and in cuter colors." 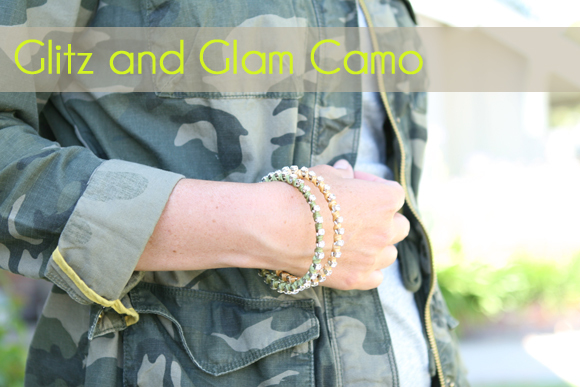 love the bling with the camo too. hello, fancy pants! these are beautiful! OOOH! LOVE these!! I am going to have to try and make them! Very very pretty, I want to make these now!